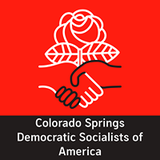 Colorado Springs Democratic Socialists of America Organizing Committee is a Colorado affiliate of Democratic Socialists of America. Contact for Colorado Springs Democratic Socialists of America Organizing Committee in April 2017 was Gregory Harden. Colorado Springs DSA Meeting. Hosted by Colorado Springs Democratic Socialists of America. Penrose Library 20 N Cascade Ave, Colorado Springs, Colorado 80903. This page was last modified on 1 August 2018, at 12:40.